Did you visit one of the M&M’s World retail stores in NYC, Las Vegas, Orlando, or London earlier this year? Did you see some adorable pint and shot glasses featuring the anthropomorphic treats? Well, you might want to stop using them, as those cute candy illustrations may contain high levels of lead and cadmium. 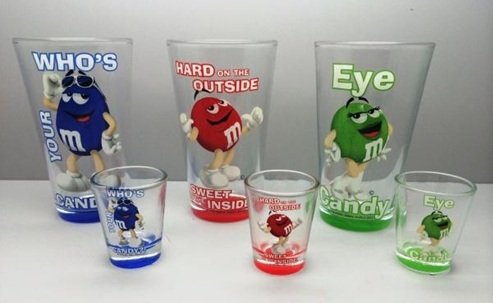 The FDA has announced a recall of six different glasses — three pints and three shot glasses — featuring three different designs that were exclusively sold at the M&M’s World stores previously mentioned. The recall only affects the 1,202 pint glasses and 6,335 shot glasses sold between the dates of January 8, 2014 and April 16, 2014. The affected glasses can be identified by the SKU# printed on the sticker affixed to the bottom of each glass.